A Williamsburg man died tragically Wednesday morning after police say he ran a red light near Wal-Mart in Corbin and slammed into a tractor/trailer. At about 8:05 a.m., Kentucky State Police Post 11 in London was notified of a two-vehicle traffic crash at the intersection of US 25E and South Stewart Road in southern Laurel County, near Wal-Mart. According to KSP Trooper First Class Don Trosper, who is investigating the accident, Dayle A. Leach, 22, of Williamsburg was driving a gray 1991 Buik Regal and was traveling southbound on US 25E when he failed to stop at a red light and struck the left side of the tractor/trailer. 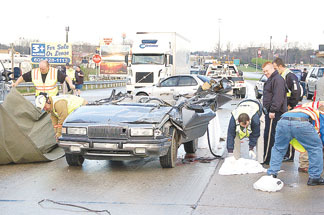 The truck, a 2006 Freightliner, driven by Gene A. Inmon, 43, of Lima, OH, was making a left turn from South Stewarrt Road into northbound US 25E at the time of the crash. Leach was partially ejected from his vehicle on impact and was not wearing a seatbelt. Authorities say Leach’s vehicle was sheared in half by the impact. Alcohol is not suspected as a factor in the crash. Inmon was not injured and police say he was wearing his seat belt. Trosper is continuing an investigation. He was assisted at the scene by officers from teh Commercial Vehicle Enforcement, Laurel County Sheriff’s Office, Laurel County Coroner’s Office and the West Knox Fire Department.